Sekar Jagat Dance is a variant of the Balinese welcome dance, choreographed by the dance artists, Ni Luh Swasthi Wijaya Bandem in 1993. The dance is based on the sacred Rejang from Asak (in Karangasem) but far more elegant, stately, and formal in presentation. The dance is accompanied by gamelan music, composed by I Nyoman Windha and is based on the Selonding music of Tenganan Pegringsingan Village. The dance depicts fragrant flowers and beautifully decorates the world. Derived from the word "Sekar" means fragrant flowers, and "Jagat" means the world. This is a group dance and danced by girls, carrying a bowl full of flowers and ornate. The happiness in welcoming the guest is presented through the graceful movements of the dancers, combined with luxurious headdress (gelungan), flowers (canangsari), and the colorful costume. The costumes and makeup is an essential part in dance performances, especially to support the expression and characterizes a dance. 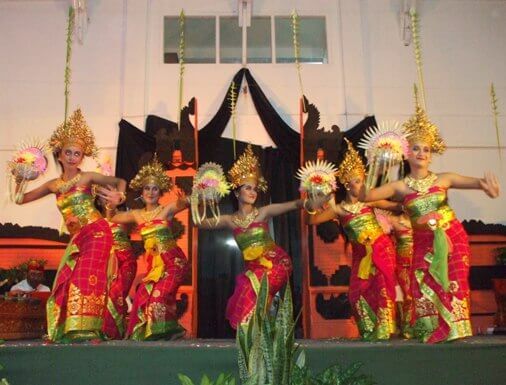 Dancers of Sekar Jagat using special headdress or gelungan with golden shades and in the rear use a single gonjer flower. On the low part, they use tapih, kamen, angkin prada, and scarves tied around the waist of dancers, so that the fabric can not be separated. There are other decoration with golden shades that add a luxurious feel to the dance like bracelets on both hand, badong on the neck, and pending worn at the waist for decoration as well as covering the scarves.